For a couple years now, I’ve met my Korean speaking partner Mi-young once a week at a coffee shop. During the first few months we always met at the Tom N Toms just up the street from me, but you can only hear their corporate-issue music loop so many times before it becomes a problem. Besides, life’s too short, and the city too big, to indulge in that kind of brand loyalty (especially loyalty to a brand that weak). Since breaking away from our original venue, we’ve met at a different Los Angeles coffee shop almost every week, using that mandate as an excuse to set foot in neighborhoods we might not normally have a reason to visit. I started meeting with Mi-young well before ever having visited Korea, so she helped to prepare me for her homeland not just linguistically, but culturally. Quite a few of our early conversations touched on one Korean culture in particular: coffee culture. She described the sheer quantity of coffee shops in Seoul as “beyond imagination,” and my first experience of the city suggested she might’ve even downplayed it. My first morning there, I walked down the street in search of coffee and passed up the first four places I came upon, because all would have required me to enter a plastic surgery clinic to get to them. (Apgujeong, am I right?) International chains, national chains, and most of all independents: you can hardly go a block without seeing one or all represented. And unlike American cities, Korean cities don’t labor under the delusion that you can have chains or independents, that the former “push out” the latter. They all just get in on the action at once. I also picked up 카페 서울 (Café Seoul, not to be confused with Café Noir), a well-designed guidebook to thirty of the city’s most distinctive coffee shops, at a used bookstore here in Koreatown. Though it came out in 2009, making it preposterously old by Korean standards, I haven’t read it out of a need for up-to-date information on Seoul’s cafés; I’ve read it out of pure fascination that coffee-shop writing has become a genre of its own in Korea, and one with enough interest behind it to support pretty lush publications. It also locks right in to my own worldview, or at least the part of my worldview that knows no more effective way to explore a city than through its coffee. Naturally, this sent the adult babies on Yelp into paroxysms. I got even more good times out of reading their “reviews” than I did out of actually going to Handsome; I remember the particularly entertaining phrase “I want coffee the way I want it” popping up more than a few times. 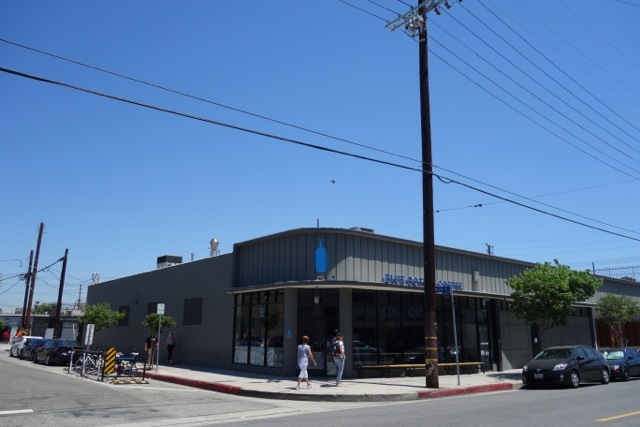 When the Arts District Handsome changed into Blue Bottle, its form stayed basically the same, though the menu expanded: now you can get sugar, cookies, a suitably fabulous milk, and so on. Blue Bottle still has pretty much everything I went to its predecessor for, although sometimes I miss the old Handsome asceticism. And really, I didn’t go to Handsome that often, not because I wanted coffee the way I wanted it (they served it exactly the way I wanted it), but because of their inconvenient distance from a Metro station. 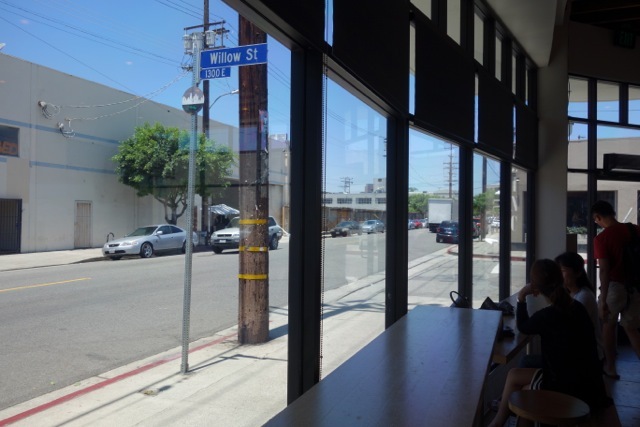 Hopping as the place seems now, that makes me wonder about its long-term viability, and even more so the viability of the Stumptown Coffee Roasters that appeared more recently even deeper in the Arts District. Something tells me Blue Bottle (which has already succeeded in Tokyo) will be smarter about that when they open in Seoul. 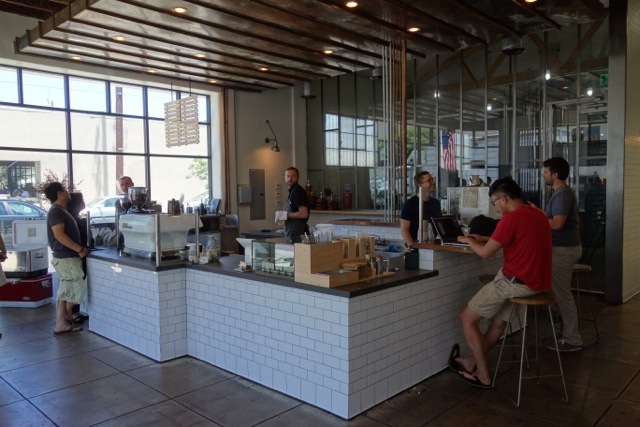 And so my Korean-language writeup of Blue Bottle follows. If you meet up with a language partner, whatever language you may study, I highly recommend bringing them pieces of writing and asking them to correct it. If they’re anything like Mi-young, they’ll get a kick out of doing it, and no other method will more clearly indicate to you the parts of the language you haven’t mastered. You can get away with criminal amounts of solecism in conversation; in writing, your every mistake blinks like a warning light, especially in the aspects of the language that most frustrate non-native speakers (particles, am I right?). Hmm, 카페 로스앤젤레스 — I feel like there’s a market for that. 최근에, 로스앤젤레스 곳곳에 파란 병들이 생겼다. 에코 파크, 베벌리가, 베니스와 브래드베리 빌딩의 빈 가게의 창문 위에서 볼 수 있게 됐다. 도대체 무슨 뜻일까? 그것은 침략이다. 샌프란시스코에서 온 블루 버틀 커피가 도착했다고 한다. 그것은 조용하게 시작되었다. 블루 버틀의 첫 (번 째) 지점은 원래 핸드섬 커피 로스터였다. 핸드섬 커피 로스터는 로스앤젤레스에서 설립되었고 빠르게 커피광들에게 존경을 받기 시작했다. 그렇지만 일반인들은 이의를 가졌다. 인터넷에서 왜 설탕은, 빵은, 두유는, 와이파이는 없냐고 불평했다. 사실 핸드섬의 메뉴는 세 가지 밖에 없었다. 커피, 에스프레소, 에스프레소와 우유 뿐이었다. 스타박스에 익숙해진 사람들은 조금 불편하게 느꼈다. 많은 것이 바뀌었지만 장소는 같다. 도심 옆에 있는 아트 디스트릭이라는 동네에 위치해 있다. 옛날에는 공업지구였는데 요즘에는 그런 활동이 덜 보인다. 사실 블루 버틀의 큰 창문 앞에 앉았을 때 주로 눈에 띄는 건, 젊은 사람과 예술가처럼 생긴 사람들이다. 물론 다른 미국 도시들처럼 노숙자도 보인다. 그렇게 아트 디스트릭은 아직 발전하고 있는 동네이기 때문에 핸드섬나 블루 버틀 카페같은 상업의 기회가 촉망되는 지역이다. 포틀랜드에서 온 스텀프타운 커피 로스터도 걸어서 15분 거리에 있다. 그런데 두 곳 다 단점은, 지하철역에서 좀 멀다는 것이다. 그럼에도 불구하고 (그들은 그래도) 결국 성공할 수 있을까? 전반적으로 블루 버틀은 성공한 회사이다. 뉴욕과 도쿄까지 커피를 사랑하는 사람들 사이에서 이미 유명하다. (그래도 내가 아는 커피광 몇명은 맛이 없다고 주장한다.) 나도 좋아하는데, 가끔씩은 핸드섬의 엄격함이 그리운 것도 사실이다. This was written by Colin Marshall. Posted on Thursday, July 30, 2015, at 9:45 am. Filed under coffee, Korea, language, Los Angeles. Bookmark the permalink. Follow comments here with the RSS feed. Comments are closed, but you can leave a trackback.